It's finally opening week in Chi-Town for the most hotly anticipated Broadway Show of the year. The Book of Mormon is here! Tickets are sold out through March 3rd, but there are still tickets available after that. Give the holiday gift of anticipation, laughter, and great memories. The Book of Mormon, written by the creators of South Park, is Broadway's smash hit. 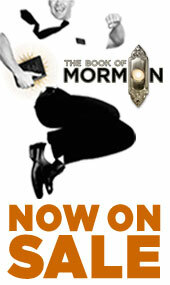 Check out The Book of Mormon in a city near you as the national tour is going on now. Click here for full tour dates, tickets, and show info. Best Availability: Tuesdays & Wednesdays. Nine 2011 Tony Awards® say it's the Best Musical of the Year. Vogue says, "It's the best musical of the last 25 years." And The New York Times says, "It's the best musical of this century." It's THE BOOK OF MORMON, the Broadway phenomenon from South Park creators Trey Parker and Matt Stone and Avenue Q co-creator Robert Lopez. The Daily Show's Jon Stewart calls it "A crowning achievement. So good, it makes me angry." Contains explicit language. Note: Tickets may not be resold in any way. Tickets may not be transferred or distributed to any person or entity for sale. For further information, please see the Broadway In Chicago Ticketing Policy. Ticket prices are $45 to $115. Have you got yours yet? !